Today a letter came from my dad. 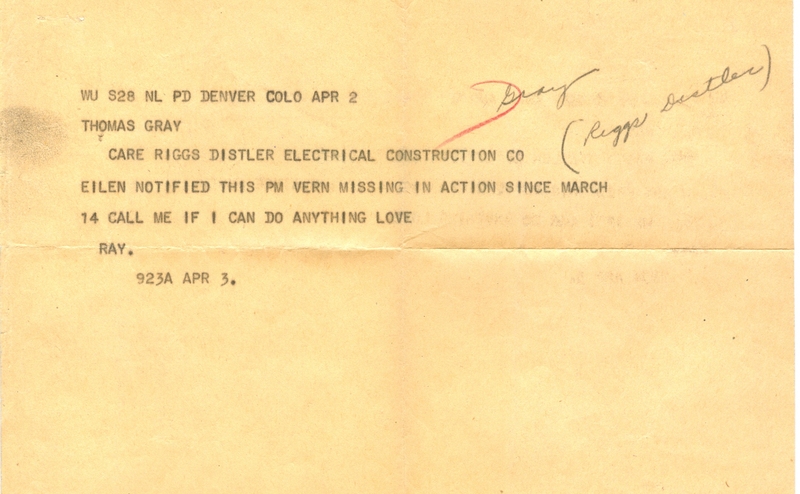 Enclosed was a telegram from Ray1 to him. Dad had to enclose the telegram because he couldn’t bear to put the thought on paper. Dad I don’t blame you; but you must have faith and hope in this case. As you say you feel and as I feel, nothing can be amiss with Shorty because we’d have somehow known it. It couldn’t happen without a ripple of excitement in heaven of that. Don’t worry about any of us boys, Mom. No matter what happens don’t ever give up hoping as it is possible and even if things look bad just have faith that everything will end up in good shape”. You can bet your boots on it. Men like that can’t be beaten anywhere. He will be ok. Please God, make it so. We all need his smile and want to have him badly. If ever my prayers be answered let this one be. We can’t lose him now. He’s so young so much life to live, so many things to do for you, so much of this world to change when the fuss is over. Too much love to give ere the curtain falls. So Father, bring him back to us, safely and soundly. Since that time I realize that He will take care of me. Believe me, it has dispelled most of my fears! By Golly! You can’t keep a man like that down. When I get home I expect to learn that he’s been heard from and is well and eagerly awaiting home coming. Until then I’ll be praying and hoping and pleading with all my heart. Please let it be thy will, Oh Lord. 1 Raymond C. Gray, Wayne’s uncle. This entry was posted in Uncategorized and tagged Raymond Claire Gray, Thomas Jason Gray, Verne Richard Gray. Bookmark the permalink. Notifications are heard or read in a blur, but never go away. The telegram coming up in my reader really grabbed me today and then reading the rest really moved me. Very moving, thank you. This sad story is the same as that of every person involved in a war. Every single one has a family that will be fearful, perhaps grieve and then maybe have their own lives changed for ever. We read or watch videos about great battles, famous leaders, heinous crimes, the technology of war, etc., but how can anyone understand a world where nearly everyone has a family member whose life is at risk. It not a family member, nearly everyone had a friend who had a family member at risk — far away in some unknown place. All they can do is wait for a letter saying “I am coming home” or a telegram from the War Department. How can any of us hope to capture the psychological mood of the time? And still not everyone knows what we know 70 years later. I feel like I’m in a time machine. This is heart wrenching. The war touched everyone and every family in one way or another —- and on a different time schedule. On April 2, Verne’s wife and his father and mother learned that he has been missing in action since March 14. Wayne learns that Verne is missing in action on April 11. It is unknown when his brother in combat in Germany learns he is missing or when his brother in Italy learns. All anyone knows is that he is missing in action. They have no details. They know nothing else. There is still hope. I know….this is so hard A Gray. Seventy years later and it feels like “real time”. I feel like I am learning this all before his wife and parents and siblings and friends. I’m waiting for them all to find out, and have their worlds crushed. I am so grateful for the sacrifice your family (and all families) made. And this blog just puts those of us not alive during that time right in the middle of the reality of it. God bless them (you) all. It was everybody’s war. It touched, in one way or another, everyone. Its effects are present even today. They are, I know when I go in to the homes of the elderly who I work for. Just an added note: Chatter Master had a “patient” who very recently passed away. She was very attached to him. He was a veteran of the 10th Mountain Division and was shot in the face in combat. Indeed, the war touches every one of us in some way as you say. I can “see” loved ones receiving the telegrams… but in no way can I possibly know the deep anguish they experienced for years to come.